Interview with Mandy Kujawa by Cathy Eaton at Jay O’Callahan storytelling workshop at Thinkers Lodge. “Each human being is a galaxy -- parents, friends, enemies, fictional characters, experiences, fears, uncertainties circle within us like planets. Stars burst into life and die within us. Yet we live most of life superficially, unaware of our vast inner world." Visit Jay O'Callahan's website for additional information. On Sunday, September 4, 2011 after Jay O’Callahan’s storytelling workshop was concluded, Cathy Eaton and Mandi Kujawa sat on the verandah of the Thinkers Lodge. The day was clear, the sea gulls called, the waves lapped. On the verandah and scattered on the lawn were Adirondack chairs where participants had shared their stories, shared their lives, and been reenergized to return to their work with a renewed sense of creativity and confidence that the workshop and Thinkers Lodge and Pugwash inspired. INTERVIEW: Transcribed by Cathy Eaton. Cathy also has a video and a digital sound recording of this interview. My name is Mandy Kujawa. 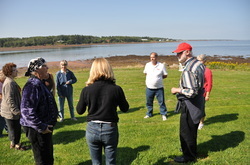 I am one of the facilitators for the Jay O’Callahan story-telling workshop at Thinkers Lodge in Pugwash, Nova Scotia. Cathy: What has it felt like to be here? Mandy: It has felt like an honor…I knew some of the story of Cyrus Eaton before I arrived and I learned more as time went on, and I got a chance to speak with Cathy. 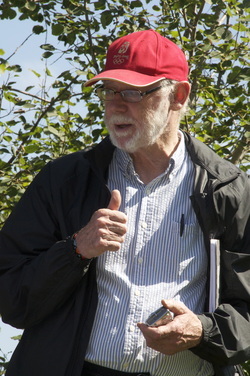 I felt like the workshop was informed by the nature of Cyrus Eaton’s vision for this place, by [John’s] vision and his hard work to make these gatherings possible. I don’t understand that kind of mind. It’s not my mind, but I’m glad it’s somebody’s mind that was able to coordinate all the millions of details…to allow [participants] to find stories within themselves that they had no idea were there. And that we could spend time together amazing each other with these stories that are inside of us. And for some people to find a different sense of peace inside them in this house that is built around the ideas of peace. Cathy: Can you tell me a little bit what is it about the house, and the chairs, and the landscape that invites people to trust each other and to be willing to share their stories? Mandy: It’s so beautiful. Even these chairs [she pointed to chairs on the verandah where we sat] and the lawn chairs speak of this graciousness of time to reflect. Look, a pair can sit here, a group can sit here so the very layout invites small conversations, large conversations. The big living room gathering place – not only is it large enough to hold people, but for me the amplification that the ceiling made for our voices when we sang together is also very profound. I just had the feeling of the history of those rooms – the other people who had been in those rooms and their intentions. Cathy: Tell me about the part that music plays in your storytelling workshops and that music played here. The role of music. Mandy: We talk about music. For some storytellers that are sort of terrified by music, we talk about it as a way of warming up for storytelling events. You know, God forbid that you should sing. This is just about warming up for [telling stories]. What we really find is that when our voices are joined (my father always used to say), that when people are singing together, there is no animosity in the room. I don’t know if that is completely true, but there is something that connects us. We are literally changing the way we vibrate in the room. There is probably some physicist who could explain what is happening, but I am having an effect. I’m making your eardrums reverberate. You’re making mine reverberate. When we sing altogether, it is somehow cohesive. Cathy: If you were talking to John right now, what would be some appreciations you would give him? Mandy: [John], I do really feel your hand in this because I respect the kind of mind that can organize something like this, to make possibilities for people like myself – I don’t have that skill, but you made a possibility for me and the others who came here to experience this depth of joy. It’s encouraging to go back into our lives with this rest and this peace that we found all together and take it out into the world. Jay, I think, has a very peaceful methodology for encouraging stories out of people. I would like to thank you [John] for giving him and me a chance to be here to spread that peace to a group of people that will then go out and work. They have talked…some of the people have talked about how they have done other workshops with Jay and how in their writers’ group they use this method. So in a very small way, we hope to contribute to peace. [John], I just felt informed by your family. I felt them kind of behind my back supporting this whole workshop. Thank you very much. Mandy: I believe that Jay became the kind of storyteller that he is by being here in Pugwash and working with Maggie and Charlie. That having the time and space in Pugwash to play with all these characters. It was his first long story. t launched his career as a storyteller. He touched the lives of these people of the community, these ordinary people so deeply and profoundly because, of course, people here would have heard the story [from Maggie Thompson and Charlie Robinson]. Just respecting their efforts. It is a story of peace. [The Herring Shed] is about all of those survivors of war finding whatever level of peace so that they were able to carry on in their lives . Workshop participant share stories and find peace and confidence.